Chapters From My Life: Why Children Do Not Talk About Being Sexually Abused? Not all children who go through abuse share their experience with their mother, or anyone who could actually help them. There is no exact scientific or psychological explanation as to why the abused children keep quiet, going through the abuse over and over again. The silence of the child could be due to various reasons. For one the whole process is big confusion for the child. They are at loss to understand what is happening, whom to trust and how to say it. They lack vocabulary to exactly tell someone about the abuse, therefore they come up with weird sentences and fumble when they have to narrate the incident. If the person who is listening does not understand the child, or shouts at them for being silly and not speaking properly, the child will definitely feel put off and may never gain courage to speak about the abuse again. They are afraid that the person they confide in will not believe them, which will lead to further problems with the abuser. Always pay extra attention to the child, if he/she is being vague in telling you something. Encourage the child to talk by putting aside whatever you are doing and try to understand them. Nothing is more important than protecting the innocence and life of your child. Also keep in mind not to show too much of attention and try to force the information out of the child. It can further increase their confusion and push them into silence. When abuser is someone known to the child, the child may not want to give up on the loved one. Even after being abused, the innocent child still loves the relative, friend or acquaintance. The clever abuser will take precautions to keep the child silent. They either make it a game of secret, or lure the child with gifts, food, toys, and in some cases threaten to harm the child or the person who the child will confide in. Fear works for the abuser most of the time, because the small innocent child will easily believe the abuser could harm someone. Children may think it is their own fault that the abuse happened to them, therefore feel too embarrassed to speak about it. The abuser, who is more experienced than the child, can instill the feeling of guilt easily into the child, which he/she may carry into their graves. They may feel guilty that they invited it in some way, or about failing to stop the abuse and many more such baseless feelings. The child suffers from guilt when they confess about the abuse as well as when they do not confess about the abuse. When they confess, they go through the feeling of betraying someone, and when they don’t they feel bad about keeping the secret and allowing abuse to happen. 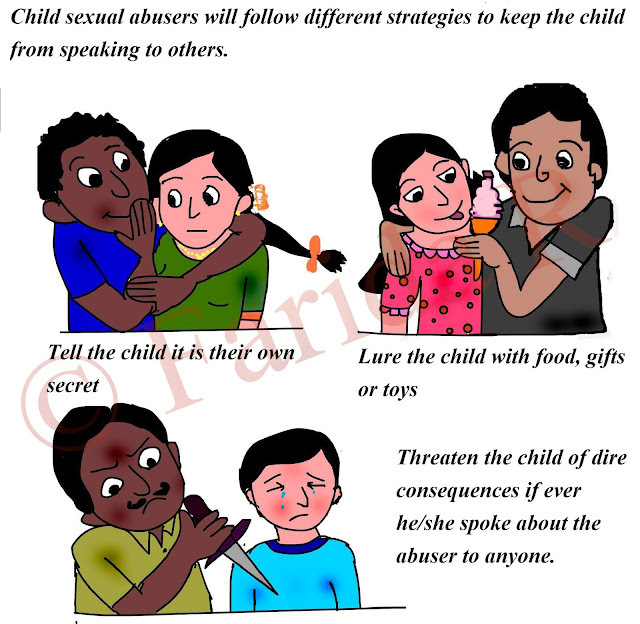 The abuser may pretend to take the consent of the child, so that the child will believe he/she has been involved in the experience. The natural response of the body to fondling may instill the feeling in the child that they enjoyed the experience thus making them equally responsible for the act. At the tender age of innocence, the child will not be able to understand that they cannot give consent and they are victims of someone’s lust. The only way to break the silence is to create awareness among the parents and children about different types of abuse taking place. Teach them to shout and ask for help, in case someone behaves inappropriately with them. Keep communication open with the child. Listen to everything they tell you, so that when they need to really talk about something scary, they will not find it difficult to communicate with you. You have raised an important topic which is very relevant with some good tips and suggestions. I recently heard from two people about the children complaining of being touched, but in both cases the parents did not realize how harmful this is. That prompted me to start of with this posts. Awareness is very important. Hmm! What devils live in the minds of people Farida that they can so damage the innocence of a child. Needful post. The saddest thing is that the protectors of the child themselves turn abusers in many cases. Again it is sad to read in today's news two instances of father abusing daughters. How betrayed and confused a child would feel in such situation. Spot on way to approach the topic Farida. I think a lot rests with parents and teachers to instill self-confidence and openness in a child, where we need to try and understand them better so we realize if something's amiss. We also need to spread awareness among our children on what is good or bad for them. Because of the increasing atrocities against children at a very young age, they've started such awareness sessions at pre-school level itself, which was never there in our times!